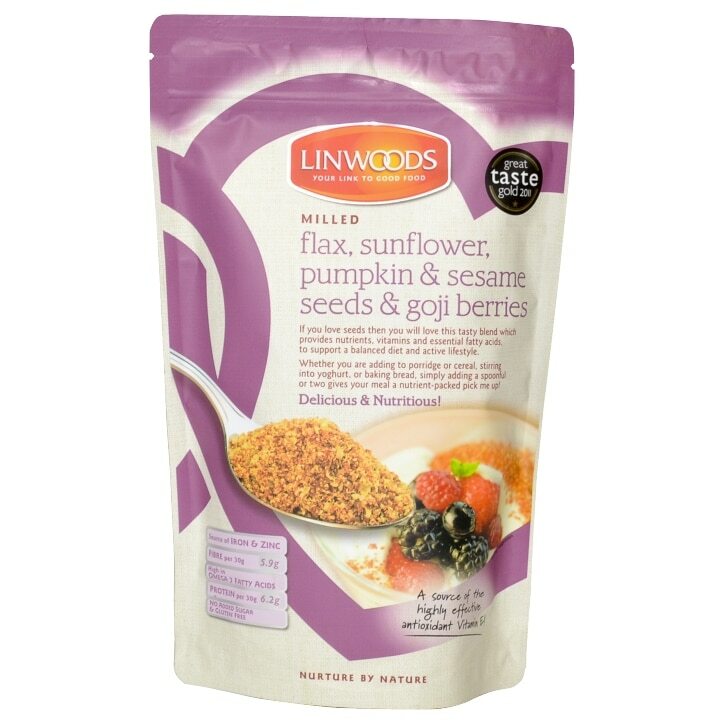 Linwoods Milled Flaxseed Sunflower Pumpkin Sesame Seeds & Goji Berries is rated 4.8 out of 5 by 58. Rated 5 out of 5 by Helen72 from Really tasty. I am glad that Holland and Barrett has this item as I was looking forward to buying these seeds individually, but even happier they are all in one at a great price. Also they are all organic ingredients. Tastes great even straight off the spoon. Rated 5 out of 5 by Lovelies from Nutritious and tasty Love this product can be sprinkled over desserts as well as cereal. Children really enjoy it and the get the extra vitamins. Rated 5 out of 5 by Elsbeth from Great quality Wonderful for breakfast, with yogurt and a drizzle of honey. I need to make sure I am eating the correct omega-s this does the trick perfectly. Rated 4 out of 5 by Ce85 from Great product These are a great product, enjoy sprinkled on cereal or in a smoothie for breakfast, or sometimes on top of yogurt. This is a good value packet and they store fine once opened.